A.D. 1887, 4th April. Nº 4970. Improvements in Apparatus for Roasting Coffee by Means of Gas. A Tubu1ar Axis upon which a perforated ventilating Roasting Cylinder revolves, the said Tubular Axis., passing thro one end of the said roasting cylinder and emits a Gas flame into the interior of the said Cylinder. Thro the Axis on the other end of the said Cylinder I pass out at will automatically, samples of the Coffee berries being roasted, and deliver on to a oscillating tray, in conjunction with the revolving of the said roasting Cylinder. Over the said cylinder which is supported on a stand, I employ a fixed cover or jacket with chimney or Hue on the top to carry off the vapour, and through this said cover I have a drop door for access to the door or slide in the said roasting Cylinder. 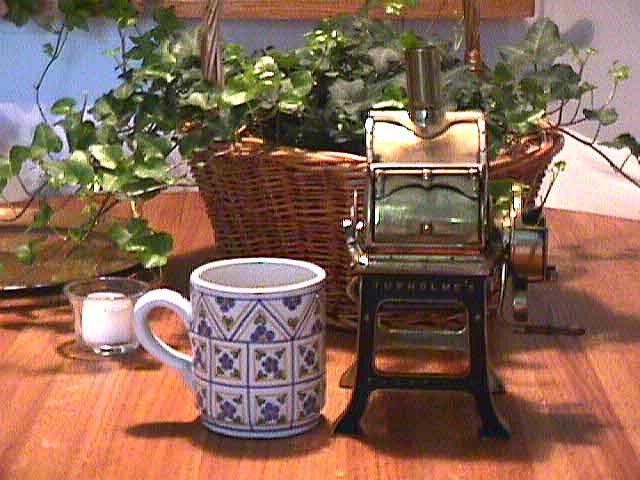 Tupholmes Improvements in Apparatus for Roasting Coffee by Means of Gas. This invention relates to apparatus for Roasting Coffee by means of gas inside a perforated sheet metal or wire cylinder. The said Roasting cylinder at one end revolving on a tubular axis through which the gas passes and the flame is emitted into the cylinder. To carry the flame across a larger and wider cylinder I have a perforated triangular tube (or any other convenient shape) secured into and projecting from this said tubular axis about half way across the cylinder. The end where the gas flame enters the said cylinder is ventilated by means of a perforated convexed collar into which the said tubular axis is passed. Inside the axis on the other end of the said cylinder I have a division or partition from end to end through one of these said divisions (being wormed) I turn out samples of 15 Coffee Berries every revolution into a collar or cup proved inside which can be either fast or suspended on the said axis, thus the samples of berries remain at the bottom of the said collar or cup and can be seen and examined for nearly one revolution then by a curve in the said collar or cup the samples are carried back and returned down the other half or division of the axis and wormed back into the Roasting cylinder. The door on the said Roasting Cylinder swings back being hinged from the end and is secured when dropped on to one or more spring catches, when the Coffee is roasted I pull this said spring catch and the door falls instantly. To facilitate the opening of this said door to re-fill cylinder (which is hot) I employ a lever secured to the door on a fulcrum thus by pulling up the lever it presses back the said spring catch liberates and also lifts open the door. To prevent the escape of heat and to carry off the vapour I have a jacket or hood which entirely covers the said Roasting cylinder this said jacket has a chimney on the top. I have also a fall door hinged in the upper part through this said door I have access to fill the Roasting Cylinder. In this said jacket I have also an opening or ventilator around the tabular axis to admit a current of air into the Roasting Cylinder near the gas flame. Immediately below this said jacket I have brackets projecting from the legs of stand against which the door of Roasting cylinder is knocked to entirely empty of berries. To oscillate the Cooler in conjunction with the revolving of the said cylinder I employ a pinion on the axis of cylinder driving a spur wheel about four times larger, in this spur wheel I have an eccentric pin working in a slotted bent lever this said lever working on a stud on the frame, near the end of this slot in the bent lever I have secured by pin a shaft which is also slotted to allow the Cooler to fall, this said slotted shaft is connected to eccentric crank which is secured to square shaft and oscillates the Cooler. Jacket door A1 and chimney X cylinder door B knocking against brackets C. C gearing for working Cooler D. D Cooler E Slide lid F in Cooler E Automatic Sampler G.
Fig. 2 is top elevation showing jacket A removed. Door B in Roasting Cylinder H lever and catch I Ventilating convexed collar J Tubular axis K Perforated tube L Automatic Sampler G.
Fig. 3 shewing side elevation with jacket S. in section. Tabular axis K passing into ventilator M on jacket A and also through perforated convexed collar J on cylinder H Automatic Sampler G Spur Wheel O Eccentric pin P Slotted bent lever Q Slotted Shaft R Eccentric crank lever S Working Cooler E Forked plates T Spanning Square Shaft U. Fig. 4 shewing Automatic Sampler in section. (1) A. fixed internal gas flame in combination with a tubular axis. (2) An inner perforated extension tube to carry the flame across larger cylinders. (3) Ventilation of cylinder around the flame by means of a perforated convexed collar. (4) Passing automatically samples of berries through the axis into a cup and return back into cylinder. (5) Opening and securing cylinder door with lever and spring catch in combination. (6) Ventilator around flame and fall door in jacket. (7) The arrangement of brackets on the stand for emptying cylinder by means of concussion. 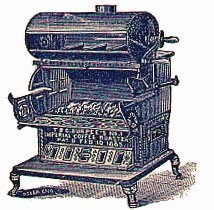 (8) The oscillating of Cooler by means of gearing attached to the Roasting Cylinder in combination with the arrangement for removing the Cooler, and for emptying the Coffee therefrom by slide door, all as heroin described and set forth and as illustrated on the accompanying sheet of drawings. Dated this 2nd day of January 1888.